I wrote about this last year and it's something I try to follow each season. With the completion of another school year of sports, the Ohio Cardinal Conference has released the final tallies for their "All-Sports" Championship, a combination of points scored based on order of finish for all boys & girls sports. For the 8th straight year, Lexington captures the crown, amassing a total of 100 points, just 1.5 points more than 2nd place Ashland who finished with 98.5 points. Only Wooster in 2003-04 has won an All-Sports title other than the Minutemen. Wooster finished 3rd this year with 77 points, West Holmes was 4th with 76.5 and Orrville checked in at 5th with 70 points. I thought with the well-rounded year the Red Riders might sneak into the top 3, but like I mentioned in last year's blog post, Orrville doesn't offer all the sports that bigger schools like Ashland and Lexington do, and therefore, can't score points in those sports' categories. Orrville was 6th heading into spring sports, but a strong spring in Softball & boys and girls track allowed the Riders to jump to 5th by year's end. Schools like Ashland, Lex and Wooster are just too deep across lots of sports and it will probably those 3 at the top of the All-Sports race for the foreseeable future. 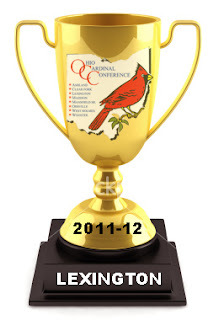 In researching this, I stumbled across the Ohio Cardinal Conference Wikipedia page, which does a great job of summarizing the various conference champions in sports since the conference's beginnings in 2003. I added some more info and created the "All-Sports" section, but if anyone else can fill in the blanks, feel free, that's what Wikipedia is all about.